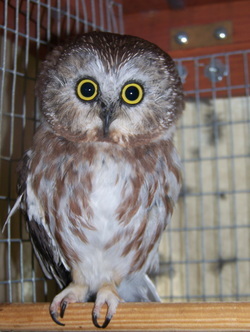 Brutus is a Saw Whet Owl, and arrived at TCWC with a frozen right wing from a poorly healed wing fracture obtained as he fledged from the nest. He is unable to fly, but a beautiful and common owl in our area. They are rarely seen because they are low on the food chain and hide in the bottom branches of dense conifer trees to avoid being eaten by larger owls. 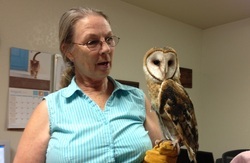 Stella is a Barn Owl being trained now to be an education bird because she came to us with a missing wingtip and will be unable to fly and hunt. These are incredibly aggressive birds and also very beautiful. She is being imprinted with the permission of the governing agencies so that she may be handled. 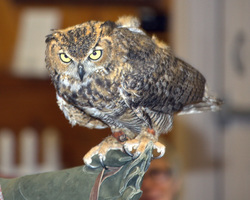 This fine young Great Horned Owl was surrendered to us after a well-meaning individual attempted to care for him. His condition was such that he could not be released, and we received a permit to keep him as an ambassador for our education program. 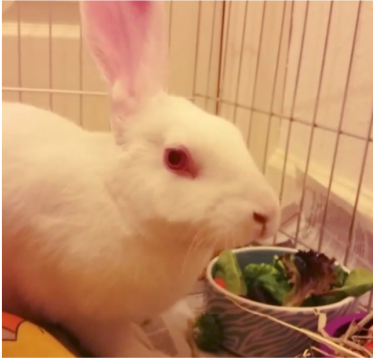 Roj came to us in June 2015 as a nearly naked eyes closed tiny white bunny. He had been found in the middle of the road by kind people who thought he was a wild bunny. We took him in thinking perhaps it was an albino brush bunny. Roj showed he was not a brush bunny within a matter of weeks because he grew and Grew and GREW. We are pretty sure now that Roj is a New Zealand White rabbit and will weigh 9-12 lbs when full grown. amazing camouflage and domestic pets with none. Tiago is a Swainson’s Hawk who came to us in the Fall of 2016 as a baby. He seemed like a perfectly normal bird, but he's refused to fly or to join up with the other Swainson’s Hawk in the flight cage. When the person who brought us this bird was questioned, we learned that she had kept him quite a long time. Tiago, we realized, was imprinted and unable to fly due to an improper diet. 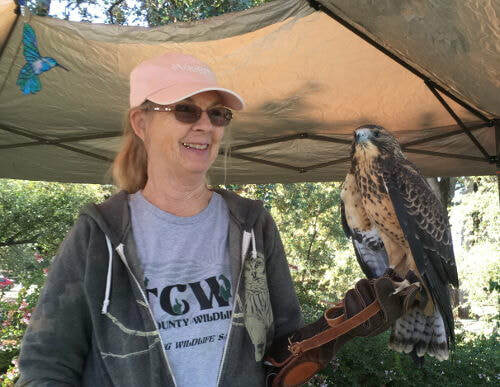 The Swainson’s Hawk became threatened by DDT which was used on the lands where it migrates. The Swainson’s is now making a comeback after their migratory lands discontinued the use of DDT. Tiago is a beautiful and calm bird and is great addition to our education team. Flash is a Peregrine Falcon that came to us in 2016 with a fractured radius and ulna. Pat worked with Dr. Smith to wrap the wing and we were hopeful he would be released. Peregrines need perfect flight because they hunt birds and can exceed 200 MPH as they dive to capture their prey. 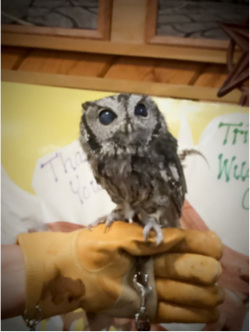 Flash did not heal perfectly and showed that he would make a great education bird because of his calm demeanor. Flash teaches us about the dangers of chemicals with the near disappearance of this bird from our use of DDT and it was listed as in endangered in 1971. With the outlawing of this pesticide and captive breeding programs, the Peregrine has made a comeback and was delisted in 1999. This bird is handled by Denise Montano.